Review: The Springfield EMP | Eagle Gun Range Inc. 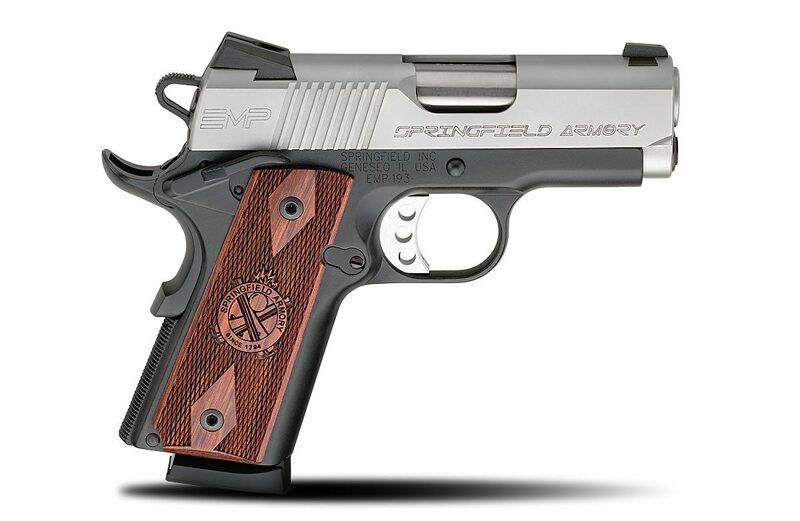 The Springfield Armory EMP is a 1911-style pistol built around the 9×19 Parabellum/Luger and .40 S&W round. Because it’s not a traditional 1911 modified to accommodate a shorter round, this subcompact pistol carries no extra bulk and it features some mechanical departures from a traditional 1911. This is a review of the 9mm model (since I could never condone the use of a .40 cal. round). The 9mm EMP, which stands for enhanced micro pistol, has a duo-tone finish with a stainless steel slide and a dark gray anodized aluminum frame. It comes with either double-diamond Cocobolo or cross cannon gray nylon grips. Because of the 9mm chambering, the EMP has a narrower grip profile than the typical 1911 chambered in .45 ACP. While 1911s are usually large and heavy, the Springfield EMP is a subcompact pistol with a 3” barrel. At 27 ounces, it’s among the lightest full-grip 1911s going. Though small, it’s a full grip for my medium-sized hands, anyway. These characteristics describe the EMP’s intended purpose: concealed carry. Why Consider the Springfield EMP? The EMP 9mm is a purpose-made concealed-carry pistol for folks who prefer the 1911 platform. Unlike some 1911s chambered in 9×19, however, the EMP was designed specifically for the smaller, shorter round, and from the specifically-fitted magazine up. The Springfield EMP is also quite a beautiful pistol. I’m especially fond of the brown Cocobolo grips on the dark gray frame, contrasting with the satin-finish steel slide. This, along with the abbreviated dimensions packs a lot of beauty into a small package. Don’t know about you, but it makes me want to hold it. Here are the two grip options for the Springfield EMP. Full disclosure: I put only about 200 rounds through the EMP at an indoor range. This experience gave me a feel for the pistol, but not a thorough understanding of its fighting capacity or reliability. Even so, I found the shooting experience to be very two-sided. First thing I noticed was that the EMP is very accurate. My first shots at 15 yards put 4 rounds inside of a dime-sized hole (with one flyer 4” away. Oh well). Further shooting showed that even though this pistol has only a 3” barrel, it is remarkably accurate. Next, the trigger is beautiful in take up, break, and reset. One of the best I’ve ever pressed. This excellent quality noted, I must say that the ~3 to 3.5 lb. trigger is far lighter than the advertized ~5 lb. trigger. While that equates to a fun/easy shooting experience, I’m not sure this light of a trigger is safe or appropriate for carry—and carry is the pistol’s entire purpose. Finally, the EMP is extraordinarily hard to hold onto while shooting. Therefore, trying to put more than two shots on target meant having to re-grip between shots. This is alien to me, as I’m used to the functional and reliable grip found on a stippled Glock frame. The lack of texturing on the front of the grip, especially, makes holding onto the EMP a futile chore. This experience quickly put me off and colors my subsequent thoughts on the pistol. If you can’t hold onto the thing, it’s pretty useless. This is a single-stack subcompact, so shooting it is somewhat different from that of the typical fighting gun. It is a very comfortable pistol to grip, but I have to say that this comfort is rendered moot after the second, or so, shot, when the pistol has climbed out of your stable grip. So for controllability, this pistol gets an F. Note, that my report is anecdotal; some may have hands that anchor the pistol in, but mine failed to do so on every pass. The grip is appropriately short for a carry pistol (its intended purpose) and the capacity is not so bad, at 9 rounds of 9mm + 1 in the chamber. Compare that to a Glock 26 and you’re only down 1 round. Respectable. It’s a single-stack pistol, so it is eminently concealable. I have to believe, though, that the 27 oz weight—somewhat exacerbated with a full magazine of ammo—will not be perfect for everyone. An extra-stiff carry belt is a requirement for the Springfield EMP. This is a beautiful gun. The satin-finish stainless steel slide is nicely done, edges and all. It contrasts beautifully with the dark gray, anodized aluminum frame set against the warm brown Cocobolo grips (on the model I tested). Aesthetically, every feature of the pistol is inviting. The frame features the 1911-typical grip safety, beavertail, and sports ambi thumb safeties. I note that the front of the grip lacks any texturing and I found this to exacerbate the lack of purchase when firing the pistol. The sights are excellent, in my opinion. The useable and accurate Tritium night sights mean most folks won’t need to consider any aftermarket replacement. The skeletonized hammer is nicely textured and reduces the weight on this already light (for a 1911) pistol. Since this pistol was built specifically for the 9mm round, there are some departures from the typical 1911 componentry. Most are internal, but there is the conspicuous lack of a barrel bushing. This means takedown is a bit different than you may be used to with a 1911, and a bit easier. From what I gather, the early models (2007 – 2009) were prone to feeding problems. The EMP has a barrel-integrated feed ramp which is a departure from the standard 1911 approach, which utilizes a frame-mounted ramp to the barrel. For whatever reason, the early models had hit-or-miss trouble with feeding ammunition generally or as specific to certain kinds of ammunition. There are/were a couple of theories as to why, but suffice it to say that some owners experienced no issues and others had full-on lemons that had to be returned to the manufacturer for refitting. These anecdotes would seem to reflect poorly on the EMP. However, from what I gather, these ammo-feeding issues have been engineered out of the Springfield EMP and it is today a typical 1911 with regard to reliability. This is a beautiful, very compact (subcompact) pistol for people who like the 1911 platform. The sights are top notch and the components are refined. The trigger is fantastic (if, perhaps, a bit too light?). The size is perfect for a concealed-carry pistol and the weight is not (for some) too great for that purpose, and excellent for a 1911. Perhaps most importantly, this is a highly accurate weapon, even as measured against a pistol of any size. It is hard to argue with this characteristic. The cost is prohibitive. Also, the EMP is a 1911, which I believe one should never use for concealed carry; the 1911-style thumb safety is a gross liability for any defensive pistol. The lack of appropriate texture on the grips—especially the front of the grip—is an unexplainable failure in the design of this gun and renders it quite difficult to shoot more than 2 rounds on target (with wet, sweaty, or bloody hands, it surely renders the pistol impossible to hold when shooting!). 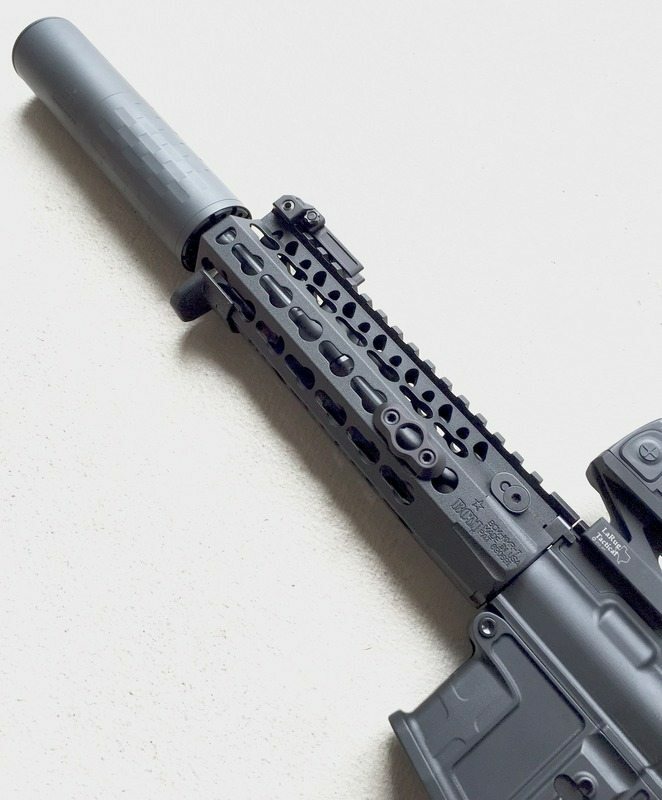 This last feature is a terminal failure for a specifically-made concealed-carry pistol. The EMP feels very nice in my hands. It is quite thin, even for a 1911, but the result is very comfortable. Trigger reach (for me) and sight picture are quite comfortable, too. Even though this is a subcompact, the grip is, for me, a full-hand grip and leaves nothing to be desired…beyond texture and grip maintainability. Recoil is relatively mild, though certainly greater than with a full-sized 1911. The 9mm round rather than .45 ACP round makes this an easier-to-shoot pistol for the size. Those aspects aside, the lack of proper grip texture had the pistol climbing out of my hand with more than, say, 2 shots on target. I found the EMP very hard to maintain control of, and not for the violence of the recoil, but for the lack of purchase on the grip. Top of class. This is a remarkably accurate pistol. It’s perhaps the most innately accurate pistol I’ve shot out of the box. I cannot comment on this from my experience. The EMP is not a pistol that one customizes outside of, perhaps, the grips and thumb safety. I have seen or read several accounts of owners who replaced the ambidextrous thumb safety with a single-sided safety lever, owing to issues of accidental toggling by a holster or clothing. I think the Springfield EMP is beautiful and seemingly well-engineered 9mm 1911 pistol. So far as 1911 carry pistols go, it likely ranks at or near the top for static quality and engineering. However, the too-light trigger and near impossibility of maintaining a good grip while shooting are heavy strikes against it. I’ll conclude that the Springfield EMP is a perfect example of a safe queen. Though, at $1,200.00, it’s perhaps a less-than-perfect example for most folks. Mr. Rutledge: I am a 42yr. law enforcement veteran and carry a weapon everyday. I own an EMP and must say your eval of this pistol is spot on. After less than 500 rds mine suffered a broken extractor and was sent back for repair. Mine doesn’t want to properly feed HP ammo, which rules it out as a CC weapon for me. Finally, it is advertised as being able to carry 9 + 1 rounds. With mine that first round out of a 9 rd mag will almost always fail to feed. It has turned into a beautiful safe queen and I am considering trading it to Sig M11 A1. Thanks for a well written piece. Thanks Steve. I’m glad you enjoyed the review. Sorry to hear about your EMP issues. It’s such a nice looking pistol that one wants it to be a flawless operator. Crummy that it seems to be a bit less reliable than the typical 1911. I’ve heard quite a few stories of woe featuring subcompact 1911 pistols. Could be the platform is just not meant to be made this small. I read many EMP range reports similar to this, and I ended up with the Sig Ultra Compact in 9mm for these reasons. So far, it eats everything I feed it from any standard 9mm 1911 magazine, and well, it looks just like the EMP. Both are beautiful handguns. Andy, thank you for your review. I’ve researched and found your review to be spot on, at what I would want for concealed carry. In fact, I emailed Springfield two weeks ago and asked if they would offer their 3.0 EMP for 2016 with front checkering (Posi-Lock) that they’ve introduced with their 4.0 EMP for 2016. I’m still waiting for a response. LOL!! But one other review mentioned that front strap checkering should have be designed. For a very nice pistol at its price range, you would think, customer suggestions would have some influence. Then I started looking at other compact pistols to compare to the EMP. I was wondering if you have reviewed or have an opinion on the Dan Wesson ECO 9mm, after having reviewed the EMP? Is it worth the high price $1663? I thought the EMP at $1249 was high enough. LOL!! Thank You, again for your review. Very much appreciated. I bought the newest version of the 9mm EMP 2 months ago. I bought the gun new from Bud’s Gun Internet Site. I first saw it online and after reading a little more, I had to have the 2016 EMP Lightweight Champion. When you see this handgun you immediately want to hold it in your hand. The fit is perfect. The stippled grip on the front of the handle has put to rest the critique on difficulty in rapid firing. The gun fits my hand perfectly. The gun is incredibly accurate. I have fired 600 rounds and the gun is smooth . I could go on and on about this GEM. Make sure you check out the newest edition with the 4 ” inch barrel. This gun is perfection and is the perfect choice for a concealed carry. Why do so many people consider a manual safety a complete failure for carry? Is that any different than say a level 3 duty holster (isn’t that the equivalent of 3 safeties)? Outside of that, great post. With that and the other reviewers, I still find myself wanting to own one, but fear the safe princess syndrome. My wife bought the emp4 about 4 months ago and at first loved it. After about 250 rounds it started to jamb . I completely cleaned it,thought that might be the problem. did not help a bit. started having more jamming and feeding problems,so i called SA and received no callback or response to emails . I took it apart again,cleaned it again, next time she shot it , she had one jamb so bad I could not get it out . Called SA again finally got to speak to someone, explained what was going on and there response was, ” take it to a gunsmith”. Not what i wanted to hear. Basically they do not want to stand behind there product! I do not recommend this gun or SA! i will never buy another Springfield product again,nor will any of my friends! I HAVE A EMP 9MM AND HAVE FOUND THAT THE CHAMBER IS VERY TIGHT WATCH THE RELOADS THEY JAM BUT WITH FASCTORY THERE IS NO TROUBLE AT ALL. HAVE NOT USED HOLLOW POINTS AS OF THIS TIME. I HAVE TRIED TO BUY SOME PARTS FOR THIS GUN. YOU CANNOT BUY THE EXTRACTOR IT HAS TO BE FACTORY FITTED THEY WILL PAY POSTAGE TO SHIP IT BACK TO THEM. AND WAS TOLD THAT THEY HAVE A LIFE TIME WARRANTY WE WILL SEE. I have one and I carry it everyday. This gun is a Kimber quality gun. It is a Springfield….. enough said. I bought a used EMP for $ 650.00 plus tax(7%). I rate this gun as high as my Colt 1911 Government Model, which is only 1 of 300 guns made. I carry both guns “every day”. I just bought a used one, expecting it in the mail in the next few days. I’ll provide a review then. However, I am a 1911 fan and happen to have 2 Sig Ultras 3.25″ in 45 ACP, both which I carry (one at a time). They are amazing shooters and come with all the bells and whistles: night sights, checkered front strap, aluminum frame, stainless barrell and slide….. it goes on. If one is looking for an alternative to the Springfield… HIGHLY recommend Sig. Get past the extractor and the block style slide… it is a piece of art. Owned a Kimber CDP Ultra II, and I will never buy another Kimber. Accurate shooter, never dependable. NEVER. Mr Rutledge , sorry you have a hard time hanging on to it, sounds like you need more practice, training, or a 380 1911 style pistol. My EMP is a thrill to shoot, I love it, and I have zero problems hanging on to it as its only a 9mm. It is very accurate and follow ups are not a problem, also it goes bang every time! I like it so much I’m looking for a EMP in .40 and maybe a EMP 4 to go along with it. A dime diameter at 15 yards is pretty impressive, i cant do that with an AR lol. But seriously i dont think the grip on this thing is bad at all its a joy to shoot compared to most compact 9s. Maybe i just shot my nano too much but i couldnt be happier with this gun so far. Only 250 rounds into it including golden sabers 124, arx 80 gr, winchester 115s, american eagles and zero malfunctions. I have the emp 3″ and have 400 rounds through it, I’ve shot it strong hand, weak hand, no malfuntions. 150 were winchester defender hollow points. now before i shot it i hand cycled it 500 times, (empty) relubed and than shot 100 winchester training rounds. sat with an empty gun cycled it 5oo times. cleaned relubed and shot the rest. at 7 yards one hole. at 40 yards about the size of my hand. I’ve always had good success with SA. especially some of their custom pistols. this weekend i will put another 250 through it and see what happens. ( i always down load the magazine one round on all my guns (unless a 7 round mag) and that seems to always help. I bought a new EMP in 2013 and have put over 3000 rounds through it. With the exception of aluminum-cased ammo, it has experienced only one failure shooting cheap cheap TulAmmo (steel cased), hollow points, etc. For some reason, my EMP just will not eject aluminum cased ammo. Based on my experience, I would place the EMP’s reliability right alongside the best Glock ever made (with the exclusion of the aluminum ammo which you would never use as your personal defense ammo). My biggest gripe with the EMP, besides its excessive cost, is its size and weight, mainly its weight. For me, it is just too heavy to carry and even a bit too big to conceal without printing somewhat. Other people may be able to easily carry and conceal the EMP with ease. The EMP is a beautiful firearm, is well made, and the lack of texturing on the front of the grip sounds like a complaint that a Glock fanboy would make. I have never found the firearm hard to hold while shooting and have never heard anyone make that complaint who has shot it. The issue of the thumb safety on a firearm is debatable. Some want a safety, others don’t. The matter of a light trigger on a 1911 is mitigated by (1) the grip safety, (2) the thumb safety, (3) keeping your finger off the trigger until ready to shoot. I think 1911s have proven themselves to be safe guns to carry given their 100+ years of existence. I don’t plan to research it, but it would be interesting to compare accidental discharges between Glocks and other guns w/o safeties and 1911s. In summary, is the Springfield EMP the perfect firearm? No – that one has not been made yet. But it is a fine weapon and if you can find a newer one at a good price, you would be proud to own it. It is not just another black plastic gun that resembles a bent piece of rebar. My experience with the EMP 9mm was a big let down. The extractor broke twice and the gun experienced a failure of some sort about every 75-100 rounds even after I sent it into springfield for a “reliability package”. When it shoots it is awesome and accurate. This is a range toy and safe queen at best but I purchased it for concealed carry and would never ever trust my life with it. You should not be evaluating any 1911. You are biased and are not capable of reporting on reality. I have 13 1911s and carry one every day unless I’m carrying a Sig. I only own one Glock and do not consider it to have any reliability advantage over any carry gun I own for the first magazine. I also own two revolvers. I have enough situational awareness to prevent me from requiring more than one magazine, so I don’t avoid any gun that cant run for 500 rounds dry. I have served in SF and am willing to bet my life on anything I carry going bang when I pull the trigger. If I’m going to be in a fire fight I wont bring a pistol. Your opinions are a reflection of your background and training. Thanks for your comment. I thought long and hard before replying, thinking it perhaps best not to. On further reflection, it is best that I reply. I sincerely appreciate your SF service. Because of that, thought, your opinions are a reflection of your background and training. You are biased and are not capable of reporting on reality. If reality is not perceived by civilians whose profession involves an extraordinary understanding of unconscious human behaviors and habitual nature (mine), reality is also not perceived by SF soldiers whose survival involves an extraordinary focus on years-ingrained, platform-specific training and of trained combatants’ tendencies (yours). As may be apparent to you, this article and indeed this entire blog are collectively not for Green Beret soldiers. On the contrary, both are specifically aimed at average citizens with significantly limited training as compared to yours and mine. Therefore, when I say, “the 1911-style thumb safety is a gross liability for any defensive pistol.” I know of what I speak for I have decades of human-behavior-study experience, especially as related to my audience. You are not my audience. You do not need my offhand remarks or my directed insights. You have things relevant to your experience hardwired (or I hope to God you do). If you were reading an article on one of the Green Berets’ blogs, you’d find content directed toward you. But you’re here on this blog and finding fault with assurances particular to comparatively untrained civilians. That is your mistake. Own up to it, but maybe keep your incongruent criticism to yourself-important mind. A “safety” gadget on a firearm is a direct and compelling corruption of safety habits for a mildly trained civilian. I don’t need your agreement; I have decades of empirical-evidence-based training and decades of horrible accounts and sickening news stories describing scenarios where an average citizen thought the “safety” on the pistol was a guard against his or her negligence, proving that these “safety” gadgets compel license to break one or all of the 4 rules of gun safety. I mean, why adhere to the 4 rules when a SAFETY SWITCH has my back? THE GUN IS “SAFE” NOW, RIGHT? So, no. No carry pistol should ever have a “safety” switch on it because safety is not a mechanical state. Safety is a human behavior. Pistols that have “safety” levers have an irresistible invitation to deadly negligence. Do your thing; carry your fave pistol with which you’ve doubtless trained for hundreds of thousands of reps and have cleaned tens of thousands of times. But for my audience I will state the inescapable fact that pistols with “safety” levers on them are a liability and not a benefit to personal safety. Cheers. I strongky advise you to rethink your stanxe on safeties. As a Glock armourer, I can assure you that your own platform has 3 safeties in it. Hence the Safe Action designation. Due to the increased number of negligence discharges that occurrred as law enforcement started converting to tge Glock, there have been a number of companies that offered manual sadeties for the Glock. BH Spring Solutions offers what appears to be the easiest to install. I have carried 1811 s, Highpowers, Sigs, and Glocks. Revolvers as well for over 30 yrs. The perfect gun is a unicorn unbuilt to date. I have lioked at any number of small 1911s latwly and found them all very accurate and reliable in real live fire drills. I have carried two Kimbers in the last few years quite safely. Just like Glocks, they require the right holster. I have reduced my carry Glocks to a single G17. I carry it often and it is my go to training platform when I am attending a course. I completed all my POST courses with Glock 22s and 23s. Never had a problem. However, a large number of peace officers have. I currently have a wider selection of guns. I have stuck to striker fired triggers mostly but my primary subcompact carry gun in a lightened DOA in 9mm. I am looking at the new EMP to back up my current customized LC9. They both shoot 9mm out of a single stack mag and carry roughly the same ammout of ammo. Perhaps you should also broaden your horizons and training as new models and platforms come out. Weaponry evolves and our reviews, training and choices evolved need to do so as well. At least that is what I taught my students as a PIST certfied instructor and teach the students I teach since I retired. I must, respectfully, disagree with your damnation of the 1911 safety. That is, I completely agree that a safety on a pistol, especially a self defense pistol, is ludicrous. The ONLY exception is the 1911. “Cocked and locked” is it’s own state. It cannot rightfully be compared to the safety on DA/SA or DAO gun. Carrying a locked 1911 demands a ready-to-go mindset. I contend that the mindset of carriers of striker fire guns is more akin to don’t-worry-it’s-always-like-that. Surely the negligent discharge statistics will back this up. Bill, I completely agree with you. If you carry a firearm, YOU must be the master of your weapons system and not let your weapons system be the master of you. If you do not train, and by train, I mean more than just static shooting but weapon manipulation, failure drills, reloading drills, shoot, move and communicate, dry fire, holster work etc YOU have no business carrying a firearm. If you do not have the muscle memory to operate a safety under stress, I do not see the logic in saying that carrying a firearm without any external safety is a benefit. Do yourself and any innocent bystanders a favor and carry a cell phone instead of a handgun. 28 years as a police officer, 10 years as a Sergeant. POST Certified Instructor in Firearms, Shotgun, and Patrol Rifle and Police Range Master. Hi Andy, thanks for the great review! It was really informative. I was just wondering, what “ammo brand” of 9mm did you use to get the accurate shots out of the emp? If memory serves, I shot 40 rounds of Federal Premium Hydroshock and the rest was Blazer Brass training ammo. I was able to get easy accuracy with either. I bought. The. Emp contour. And. The 3in black. Emp,put the 3in slide and barrel. On the contour. Ended up with a all black contour with 3 in barrel. The perfect carry gun. For me. Very. Expensive. But a butifull and accurate. Gun. What do I do with. The contour slide and. Emp3in black frame. Suggestions? This is why I carry a Charter Arms .44 special as my everday carry. The .40 cal round is already the most punishing ammo on any pistol and Springfield’s blanket policy is no +p rounds in any of their guns with barrels shorter than 5″. So that’s already some explicit power limitation prescription. I don’t know how this translates to .40 cal or specifically to the EMP, so I highly recommend that you contact Springfield directly with your question. Dear Andy, I just bought my 1st SA EMP gun (to be honest without much research … mostly on the how great if feels in the hand) for practice/target shooting. I found your review (and subsequent comments) to be extremely informative. Thank you. I am not sure I could completely follow your logic on the safety as a weakness for this gun… although unlike your other readers, I have very limited experience. My question is on something you did not cover much here… which is maintenance and cleaning… could you please comment on your experience and may be make some recommendations? (how frequently, how thorough… kinds of oils and solvents etc.) Thank you! – Clean after every time you shoot the gun. Yes, most firearms can function just fine with cleaning every 1000 rounds or so, but that ignores 100% reliability and the corrosive effects of grime. If you DON’T shoot the gun for a while, be sure to clean it every month regardless (but be sure to train with your gun every week!). – I use Rem Oil spray and wipes exclusively and have never found it to be lacking in any respect for cleaning or protection. I recommend you watch several videos on the cleaning of your specific gun so that you get various perspectives. – After cleaning, make sure most of the gun parts are 100% bone dry and only lube those specific components or surfaces that require lube. This is vital. – Research and learn what components wear out and on what round-count schedule to replace them. This varies from gun model to model. This is how you keep a gun running perfectly for years. Several of my Glocks have 70,000+ rounds through them and run perfectly because I replace the appropriate parts from time to time. Hope that helps. Take care, train often, and best of luck! Dear Andy, I finally got to the range today and shot first 50 rounds through my EMP… I have to agree 200% with your assessment of the gun. BUT the gun fits like a glove in my hand and I have relatively small hands… it was a lot of fun to shoot. The gun was also surprisingly accurate (same density as my full size Beretta 92… at 35 yds) The gun is a nice addition to my collection. Glad I spend $1000 on it.